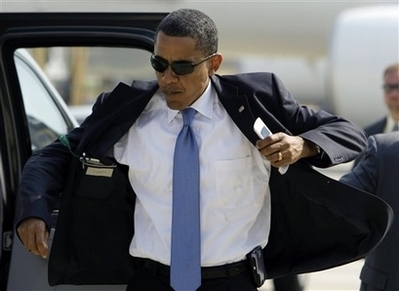 I understand that the Secret Service may not allow President Obama to continue to wear his beloved Blackberry on his belt, citing it as a security risk. Personally, I think that they are simply forcing him to live up to his own elegance. This entry was posted in Elegantology and tagged Blackberry, President Obama. Bookmark the permalink. i prefer you determining what my men can wear and not wear. even my beloved OBAMA !! The only question I had after looking at the photo was to wonder who made the suit. If they let him keep the crackberry, maybe they’ll give it to a handler much like the fellow that carries the football? An iphone would fit nicely in the breast pocket of his suit. I agree. But…did you see the layout in the NYT magazine this weekend of photos of the President’s team? The women almost all looked very elegant. Only one or two exceptions. The opposite was true for the men! One or two looked great. The rest looked like unmade beds [as my mom would have said]! If I had my photo taken for the NYT and it wound up looking like some of those guys, I would DIE. I cannot wait for tomorrow! No more cowboy hats! Huzzah! MLane… I thought those were just the most ghastly pictures! The one of Mrs. Clinton was dreadful. Hate to say it, but Barack is more elegant than you’ll ever be. And he doesn’t even try. Regretful Anon, how pleasant that you are on a first name basis with the new President. If you’ll read the tagline in my header, you’ll realize that this is a search for an everyday elegance. Neither can I claim to be a Cary Grant. Mr. Obama is tall, athletic, well-tailored, well-spoken and intelligent. All key elements of elegance. And yes, yours is an easy comment to make. Thank you for reading. Enjoy the inauguration. Apparently, someone woke up on the wrong side of the bed. Although President Obama appears elegant on the outside, true elegance bears out in character. A good degree of confidence is elegant, arrogance and brashness is not. Gratitude is an elegant trait, snubbing and offering up cheap insults to those who came before you is not. Insulting America overseas–not elegant. Smoking is not terribly elegant, nor is keeping company with people like that dreadful minister or folks who throw bombs to express their opinions, no matter how useful they may prove to be to your career goals. Sometimes looks are deceiving. Like President Bush’s decisions or not, the man is supremely elegant. He will even be elegant in his afterlife, because at his very core he is a gentleman of impeccable character. I, for one, will miss both him and Mrs. Bush terribly. I was under the impression that the reason for the Blackberry nixing was not security, but the Presidential Records Act of 1978. But I could be wrong.